Irrepressible heiress and intrepid sleuth Francesca Cahill moves from her own elegant world of Fifth Avenue to the teeming underbelly of society, a place of pride, passions…and sometimes deadly perversions. Despite the misgivings of her fiancé, Calder Hart, Francesca cannot turn away from a threat that is terrorizing the tenement neighborhood of Lower Manhattan. A madman has attacked three women, but while the first two victims survived, the third is dead, raising the stakes. All the victims are impoverished but beautiful Irishwomen—and Francesca fears that Maggie Kennedy and Gwen O’Neil, two friends who live nearby, could be next. 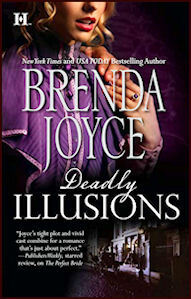 Listen to a audio clip from Deadly Illusions, on sale March 25, 2014 from Audible, an Amazon company. The crime scene was a gruesome one, indeed. Chilled, Francesca Cahill stared at the woman. She was clad only in her corset, chemise and drawers, lying in a pool of blood, the same dark red-brown color as her hair. Chills swept up and down her spine, chills that had nothing to do with the temperature of the day, as it was warm and sunny outside, a perfect spring day. Not that one would ever guess that fact from this tenement flat. The railroad apartment that Francesca had so boldly entered was long and narrow, consisting of a single room. A window at each end let in some light, but not much—as the brick building just a few feet behind this one blocked out much of the daylight. At the flat’s far end was the victim’s bed, where she lay in her underclothes and in, Francesca supposed, her own blood. Francesca stood in the doorway, the dark, dank corridor behind her. Between her and the victim were so many signs of a vital if impoverished life—a small sofa, the muddy-hued fabric torn and ripped, a faded and torn throw rug, a pail of water there, as if the victim had been soaking her feet before bed. Beyond the small salon area, there was rickety square table and two equally despairing chairs, one with a leg taped together. In the kitchen’s area, there was a wood counter covered with some stacked plates and utensils, a wood burning stove and a sink. There was a pot and some other items in the sink as well. In the other direction, behind Francesca, there was a police sawhorse in the doorway of the flat. An officer had placed a Do Not Cross sign upon it. A man carefully viewed the body. Portly, of medium height, his suit shabby and tweed, Francesca recognized him instantly. She coughed to make her presence known, starting forward, her navy blue skirts sweeping around her, tendrils of blond hair escaping her chignon and smart little navy blue hat. In her gloved hands, she clutched a purse. He whirled. “Miz Cahill!” He cried, clearly surprised to find her there in the apartment. She smiled warmly, determined not to be ousted from the crime scene. Not that this was her case, as she had no client requiring her to investigate this murder. “Inspector Newman, good day. Although from the look of things, this has not been a good day for the victim.” She cast another glance at the dead woman, who appeared, at this closer ranger, to be in her early twenties. She had been a pretty young woman. Newman had closed her eyes. Her heart did flip a little. She hadn’t seen the Police Commissioner in weeks, not really. Passing him in the hall of Bellevue Hospital after almost visiting his wife did not count. “I’m afraid I am alone. Does this appear to be the work of the Slasher?” She asked, her gaze drawn to the victim as a moth is drawn to candlelight. Francesca nodded gravely, her gaze briefly on Newman. If the newspapers were to be believed—and Francesca knew very well one could not always believe what the dailies reported—there was a pattern here. According to the Tribune, the first two victims had been young, pretty and Irish. The victims, however, had not been murdered, merely slashed at their throats and traumatized. But the second slashing was sensational enough to warrant a headline. Of course, the first two victims were alive and this woman was dead, so maybe there was no connection. Francesca did not believe it for a moment. She had learned since embarking on her profession of criminal investigation that she had very accurate instincts. They shrieked at her now. The Slasher was at work here—and the stakes had suddenly changed. Murder was now the name of the game. She shivered. And that most definitely made the case her affair—as people she cared about lived two doors down. “Do we know her name?” She asked softly, noting the way the woman lay. Her arms were flung out, her head turned to the side. There had been a struggle. She felt certain that the dead woman was also Irish. “Yes. Her name is Margaret Cooper.” He also turned to stare at the victim. Francesca didn’t hesitate. “I am officially on this case, Inspector, and we both know the Commissioner will be supportive of that.” She smiled, at once friendly and firm. But she no longer knew just how supportive of her investigative work Rick Bragg would be. So much had changed—and so quickly. “Well, I guess I won’t have to decide!” Newman cried in relief as footsteps sounded behind them from the hallway. Francesca didn’t have to turn to know who it was. She tensed as the Police Commissioner strode past the sawhorse and into the room. He was a handsome, charismatic man. Once, she had thought him the most handsome man on the planet, but that had been before she had learned of his estranged wife and his on again off again marriage. Rick Bragg stood a bit over six feet tall, his stride long and purposeful, his shoulders broad, the brown duster he wore for motoring swinging about him. His complexion was dark, his hair golden, and no one looking at him could mistake his air of authority and purpose. In fact, the night they had met, at a ball held by her family, in spite of the crowd, she had seen him the moment he entered the room. But that felt like a different lifetime—she had been a different woman, oh yes. Their gazes met and held. She realized she had bit her lip and that her fists were balled up. Her pulse had also accelerated. “Hello,” she said, trying not to be nervous. But it was hard. Once, they had been in love. Now she was engaged to his most bitter rival—his half-brother, the wealthy and notorious Calder Hart. She stared into his amber eyes and instantly saw how tired he was, both emotionally and physically. She ached for him. She knew he had agonized over the condition of his wife. And suddenly she did not want to talk about Margaret Cooper—she wanted to talk about him, his wife, and the two children fostering with them. She wanted to take his hand—she wanted to help. Instead, briskly, she said, “I ran into Isaacson from the Tribune.” She tried to smile but it felt like a grimace and he simply stared, saying nothing. Her anxiety increased and she clutched her purse with both hands. “He must have been at Headquarters when the call came in. When he told me that it might be the Slasher, and that the victim lived on 10th Street and Avenue A, I had to come directly over. Maggie and her children live two doors away, Bragg,” she said earnestly. “I know,” he said. His expression softened. “I was concerned myself.” He hesitated, studying her with some intensity, his gaze dipping to the way she held her purse. She smiled a little at him. He did not smile back. It was simply awkward now, being with him. What should she say, what should she do? Were they still friends? Did he hate her? Had he forgiven her for becoming engaged to the man he bitterly despised? Had he accepted the fact that one day she would marry Hart? For she had finally, with great difficulty, accepted the fact that he belonged with his wife. Francesca wanted to reach out to him and demand answers to all those questions, but she did not dare. How selfish it would be. But God, there was no one she admired more, no one more noble, more determined, more honorable than Rick Bragg. He had been appointed Police Commissioner to reform the city’s infamously corrupt police department, but it was like spitting into the wind. He had fired some officers, hired new ones, he had reassigned entire units, but every small step forward was gained at a painful cost. The press hounded his every move. The clergy and the reform movement demanded more—politics demanded he do far less. Tammany Hall had lost the last election, but still ruled most of the city. He was up against Platt’s political organization, and the mayor, elected on a reform platform, did not always back him up, afraid of losing the working man’s vote. An election loomed, one Mayor Low did not want to lose. Bragg fought it all, alone. She knew he would never give up. And all this with his wife lying in the hospital, the victim of a tragic carriage accident. “I heard that Leigh Anne will be going home soon,” she suddenly said, reaching for his hand without thinking about it. He started as her fingers closed over his, and realizing what she had done, she quickly released him. “Yes, in fact, they will release her tomorrow.” He looked away. Francesca knew him so well—or once, she had. Now, she could not tell whether it was grief or guilt that made him flinch and turn away. “Thank God she regained consciousness within days,” Francesca whispered, a small hurt inside of her heart. Why couldn’t she simply hug him and hold him close? He needed to be comforted, that much she knew. She might be engaged to another man, but she would always love him too. He was grim and he did not speak. “Is the prognosis the same?” She had to ask. She had gone to the hospital several times, but in the end, had only visited with all the Braggs who had been coming and going to see Leigh Anne, and not with Leigh Anne herself. She had been afraid of her reception; she had not wanted to upset the other woman, either. “She will never walk again.” His tone was flat, final. He glanced past her, at the victim. “If this is the work of the so-called “Slasher”, then we have a serial killer on the loose.” He walked over to the bed. “She was found at noon today. But I am going to hazard a guess that she was killed last night, Francesca.” He did give her a significant look. He leaned over the woman and moved her long, tangled dark red hair away from her neck. Her throat was brutally slit. Francesca wanted to gag; instead, she closed her eyes and breathed hard. No matter how many cases she had, she would never grow accustomed to violence and death. But there had only been six investigations thus far. Her career as a sleuth had begun last January when her neighbor’s son had been abducted. She had tried to help, never imagining how it would change her life. “I have no idea. But if she was murdered Monday, Francesca, and if the Slasher holds true to the course he has set, there will be another victim in six days, exactly.” He faced her and their gazes met. She was thrilled at the gesture of intimacy and she smiled back. “I also assume the Slasher is a man, but we cannot rule out a woman. Remember, the Cross Killer turned out to be Lizzie O’Brien,” she said, referring to a previous case. Bells rang. Francesca stiffened. “Bragg! Not Gwen O’Neil?” And an image of the striking redhead assailed her mind.